Aqua Teen Hunger Force = Terrorism?! 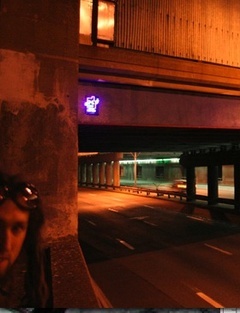 This morning, artist Peter Berdovsky and his partner Sean Stevens were arrested for placing magnetic light boards of the Aqua Teen Hunger Force characters the “Mooninites” [shown in the adjacent image, flipping the bird] around Boston, as part of a guerrilla marketing campaign for the Cartoon Network. As you may have heard on the news, the lights were mistaken for bombs—a gaffe that led to the closure of several major roads and the deployment of an anti-terrorism squad. Turner Broadcasting, the parent company of the Cartoon Network and a division of TimeWarner (which just sold PopSci), has claimed responsibility for the marketing campaign. Humorless Boston mayor Thomas Menino has likewise vowed to “take any and all legal action” against Turner. OK, so let’s step back for a second. The New York Times reported that similar light boards have been in placed in 10 cities (including New York, Los Angeles, Seattle, Austin and Philadelphia) for two weeks, and none of the other cities called out bomb squads. What was it about the Boston incident that set off alarms? The boxes were placed in the Boston subway and on a bridge, which was kind of an idiotic idea. But it’s a shame that Berdovsky has become the scapegoat for this stunt. He’s an artist! He did installations (view a video of the ATHF “mission” here), which is what he was hired to do, and it’s perfectly understandable that he wouldn’t think of his art as a potential terrorist threat. Turner Broadcasting certainly should have considered that possibility when it approved the marketing plan—a fact the company has implicitly admitted. UPDATE: This press conference video with Berdovsky and Stevens is not to be missed. Also, our friends over at MAKE have some detailed pictures of one of the offending devices. Check them out here. I think your article hit the nail on the head--this was the only city that panicked like Chicken Little. Instead of looking to lay blame on someone else, Boston authorities should be ashamed of their cowardice and ignorance. What will will they mistake as a bomb next? The jukebox at the local pub? I'm all for safety, but where has common sense went? For an "educated and cultured" populace, they just set themselves back about 500 years and will be burning scientists as witches next. When I saw the picture, I chuckled. To me that's nothing more than a unique advertising campaign. An LED sculpture looks nothing like a bomb in my opinion, and the artist who was hired to put it there is the last person who should be blamed. As for lightboard ideas, how about one that simply says NOT A BOMB. Nah, that wouldn't even work. PopSci would be in court right beside Berdovsky. I'd say their choice to mistake these things for a bomb reflects poorly on their training. This is obviously not a bomb. Since when have terrorists made their devices with bright lights in the form of cartoon characters giving the finger? The mayor is making a big stink about how it's the responsibility of those who planted these that all sorts of resources were diverted and roads/rails were closed. It's not the artist's fault if someone choses to respond in an absurd fasion. If they don't teach how to appropriately scale a reaction in training, they really should. Like the author said, if this could be a bomb, what next!?!? i agree with MultiSlacking, i mean this is a town that burned people on suspicions, hearsay and rumors of witches. It was stupid and deserving of some kind of punishment. The thinking expressed here is typically GenX and that of a selfish six year old. HOw do any of you KNOW what a bomb looks like? When was the last time you saw one? I can guarantee you that no one riding the Tube in London last summer thinks this is funny. Besides the offensive "art", and what by the way gives you the right to put your offensive "art" in my life, this is unbelievably stupid. We live in a world where bombs go off every day, and it will happen here; islamifascists test us every day. And they are not the only ones. I can only imagine what the folks in Oklahoma City think of Interference Marketing. If you think this is all so funny, spend a couple of days on Jaffa Street in Israel. I suspect that Ted Turner will sue the pants of the geniuses now running Turner Networks, and I hope we send a few good Marines after the idiot who runs IM. Society hasn't the time for these few children who think that they can do whatever they want, whenever they want, regardless of whom they might affect. These jerks are right up there with every hacker and virus writer; and burning them at the stake is not such a bad idea. My biggest fear is that this serves as a disincentive to future clever marketing methods. There's also a lesson to be learned about herd behavior in situations like this... and why those with common sense don't speak out. I think Groggo exemplifies the mentality of those who lose clarity of thought by becoming emotionally charged. Fear is the motivation through which irrational behavior can be justified. Terrorism is a real threat, but to live in such fear is unbecoming of the American way. I agree with Robin Cumberland ("It was stupid and deserving of some kind of punishment.") The reaction of the Boston authorities WAS stupid. For that many law enforcement officials to act like Barney Fife on methamphetamines deserves some kind of punishment. They need to be able to recognize a real threat when one arises, for the safety of Bostonians. It seem appropriate that a criminally stupid cartoon would have a stupid and criminal advertising campain. Berdovsky did a dumb thing in his placement of his "art", especially in today's society that encourages everyone to be vigilant. And what he did was illegal. In my state, there are laws against putting signs and displays on bridges. It is a very legitimate safety concern. Remember, a lady was killed in a Big Dig tunnel when something that was thought to be permanently affixed came loose. I don't think art should threaten people's lives. If this had been in London, with their experience with IRA bombings and the latest terror bombings, people would want to string Berdovsky up, and they outlawed the death penalty. I also do not blame anyone in Boston for not hearing of this so called campaign; I have not heard of it until this story broke. My last comment is on the critisism of Boston officials. I think that any critisism of Boston's overreaction to be inappropriate. If this had been a terrorist plot and the city officials had underreacted, we would be screaming for their heads. It's a silly meaningless harmless sign. If they were backpacks (any kind of enclosed pack) or Ryder (any rental company) trucks sitting on the side of a bridge or road or building then Boston has a case, but a stupid cartoonish like sign, especially one so easy to see it's parts, NO WAY. Instead, Boston should go after the clowns for the vulgar and obscene jesture that the sign displayed and the fact that, like Randy mentioned, they were placed where they could fall and hurt someone. I know what a bomb can look like and have enough sense to know that a terrorist will not draw attention to his bomb by flashing lights on it that say, "Here I Am!" I hope you can see this, because I am typing it as hard as I can. But remember...these Mooninites were seen during the day by a commuter, so the lights were not lit. It just looked like a suspicious package on a bridge. At night, it's quite obvious that it's nothing harmful. Honestly, putting them on bridges wasn't a good idea. Boston is overreacting (embarrassment goes a long way), but this dude should have thought about placement a little better. I doubt Boston officials bothered to ask if anyone recognized these small light displays. Any adult with teenagers would have recognized them. Then again, too many adults have no idea what theirs kids are watching on TV, a separate topic of discussion. I ask then, are Boston officials going to start hunting down and prosecuting those who dare to place lighted displays the windows of their bars and restaurants? These little light displays look and operate just like them. Watch out Budweiser, you may be next! Led signs for promotion? No. Witchcraft I say. Frankly for the particular cartoon in question this is the ABSOLUTE BEST kind of publicity they could have hoped for (Mooninites run amok). They now have the attention of most of their target audience (as well as many who aren't the target audience), and I would bet you that MOST are laughing hysterically at how a simple ad for a cartoon could cause so much comotion. Any legal costs Turner Broadcasting must pay can simply be counted as part of their advertising budget. The only real issue I can see is whether or not a permit was needed to place these boxes and whether or not they acquired such permission. If they did then the city of Boston has no case and there is clearly a disconnect between the beauracratic elements within the city. If they did not have any permission then clearly that was a stupid move on their part. with eggs hidden in the major cities of each of the fifty states. "clearly intended" the lightboxes to be mistaken for bombs. themselves with flashing lights and cartoon characters. they were paid Russian agents". The first thing that came to my mind was "caseing". That is, an operation to judge the authorities response techniques and response times. Now that I have seen the pictures I don't think that is the case but remember: think outside the box. Most criminals will "case the joint" to evaluate. I think a relitive scaled fine where laws were broken would be appicable here. If there are laws in that state/city, that state you can't display an unauthorized sign on public property, or attatch anything to a bridge or in a subway... well... thats the law and they apply. However, if I were one with authority I'd do my best to learn from the mistake and correct. There was another news story that was pretty much ignored. An actually device was planted in a separate incident that was made to look like a pipe bomb. The guy wasn't charged. some of yall need to lighten up. oh, and what give them the right to put that up where you might see one? a little thing called the first amendment. you all are questioning the placement on the bridges and subways, but form a marketing standpoint that was where most of the traffic, and thus a large audience would see this. i have seen bombs in real life, and the last thing they would do is put them on the OUTSIDE of the structure so people could call and tip off the authorities. burning at the stake? i mean come on now, thats a bit much. i would agree some small fines for putting unauthorized signs would be in order, and possibly a couple for "littering" unless he planned on retrieving the devices once the batteries were dead. also, i am believing that the LEDs were on at all times, unless this person decided to put a photo sensitive cell in each and took the time to program chip sets to shut off when there was enough light. so the people should have been able to see at least a faint symbol against the black backgrounds. The part that no one really is talking about is the fact that Interference did their job. Probably better than they thought they would. Look at all of us talking about Aqua Teen now. It's on CNN, it's on Fox News. Money can't buy the kind of press they are getting. I bet Turner is loving every second of it. They'll get a law suit against them and have to pay a fine or something. They don't care. Job accomplished. People are talking about their shows.